The banner o Guyana, kent as The Gowden Arraeheid, wis adoptit in 1966. It wis designed bi Whitney Smith, an American vexillologist (tho oreeginally athoot the black an white fimbriations, which wur addit bi the College o Airms in the Unitit Kinrick). The colours are seembolic: green for agricultur an forests, white for rivers an water, gowd for mineral wealth, black for endurance, an reid for zeal an dynamism. 23px Banner o Guyana, same design as its banner, but on a 1:2. Banner o Breetish Guyana, 1875-1906. Banner o Breetish Guyana, 1906-1954. Banner o Breetish Guyana, 1954-1966. 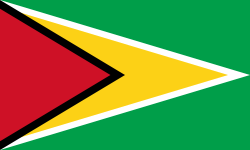 Wikimedia Commons haes media relatit tae Flags of Guyana. This page wis last eeditit on 5 August 2017, at 02:16.